A technique used to cook ingredients in hot liquid (water, stock, wine or a flavored stock, either sweet or savory). The ingredient to be cooked, whether it is a fruit, vegetable or a protein, is cooked in barely simmering water until done. Poaching is considered a fairly gentle cooking technique. 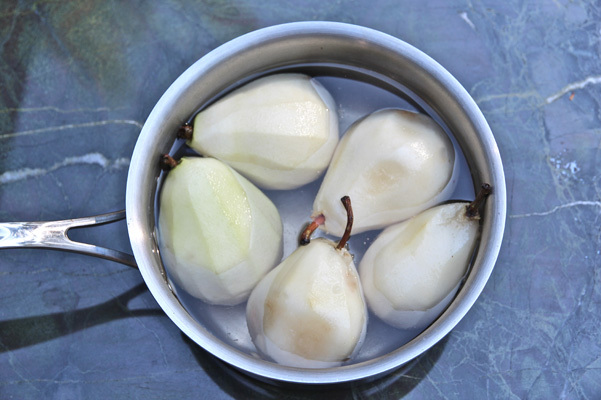 Poaching liquid, which retains some of the flavor from the cooked food item, can be discarded or is sometimes used in other parts of a recipe to take advantage of the residual flavors (see Pear Frangipane Tart). Obviously, water will not lend any flavor to the cooking item; flavored liquids will, and you can use this to your advantage by adding spices, for instance.